This sweet Aaron Basha baby shoe from the Shoe collection will grace your charm bracelet or necklace beautifully. 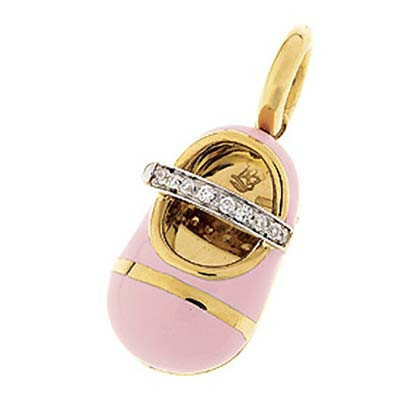 Designed in lush 18kt yellow gold, the baby shoe is enameled in a light pink coating with a yellow gold stripe across the toe. The brilliant white diamonds across the shoe strap add a festive touch and sparkly shine to this delightful piece. Enjoy a whimsical glimpse of Aaron Basha beauty with this treasured charm.